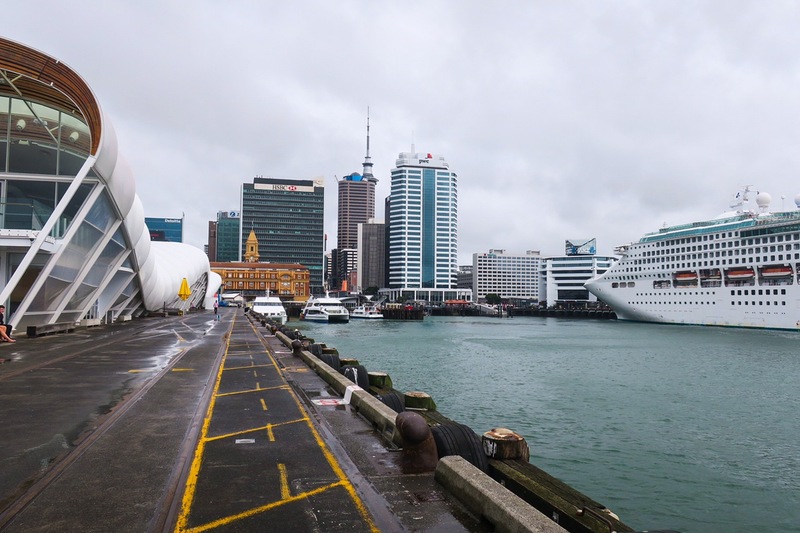 Christchurch and Auckland were our last two stops in New Zealand. 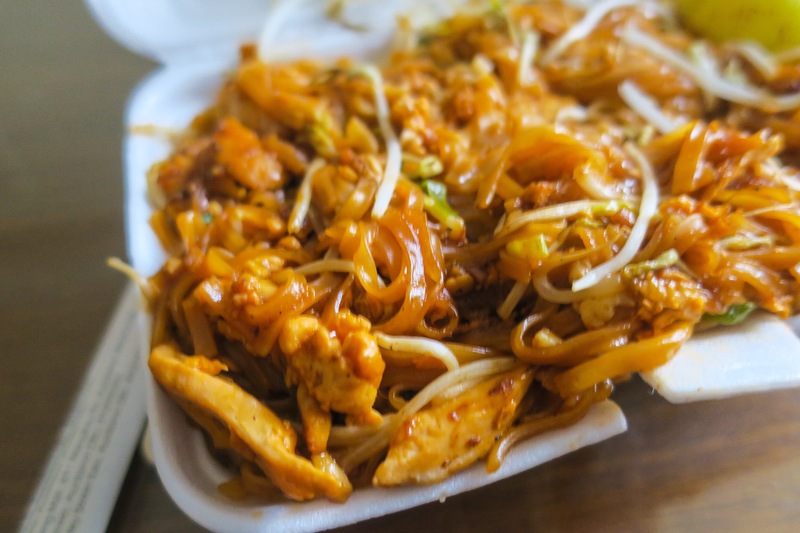 After traveling through mostly rural areas and being in small towns, it was nice to be back in bigger, more populated cities with many more choices for food! 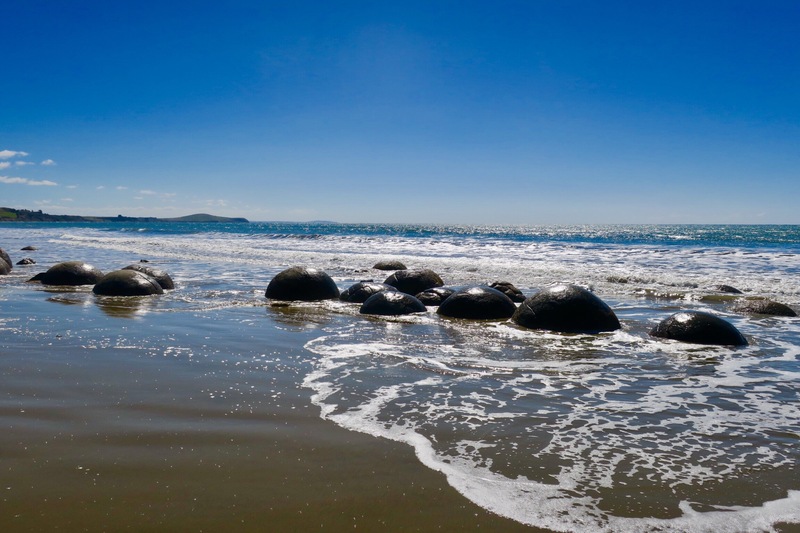 The next day, officially on our way to Christchurch, we stopped at the Moeraki Boulders – unusually large, perfectly smooth surfaced boulders sitting right on the beach and embedded into the sand made up of mud, fine silt and clay, cemented by calcite. They are quite the sight! 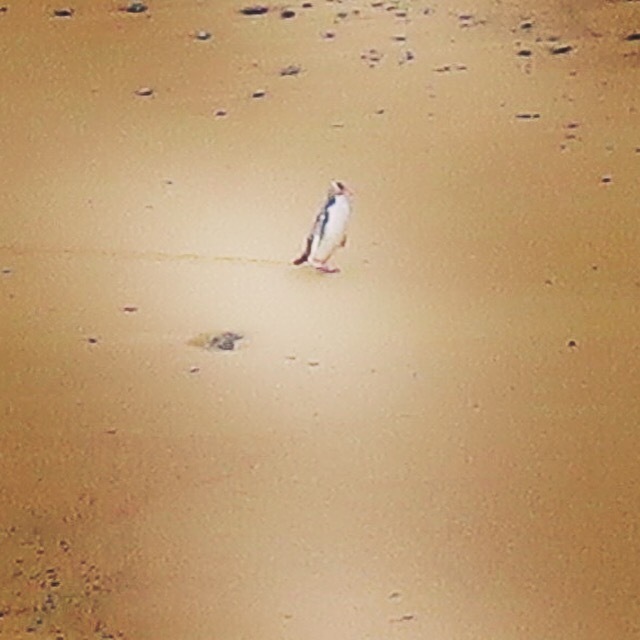 We had fun going to see them, hopping on top and walking up and down the beach with our feet in the sand and ocean. 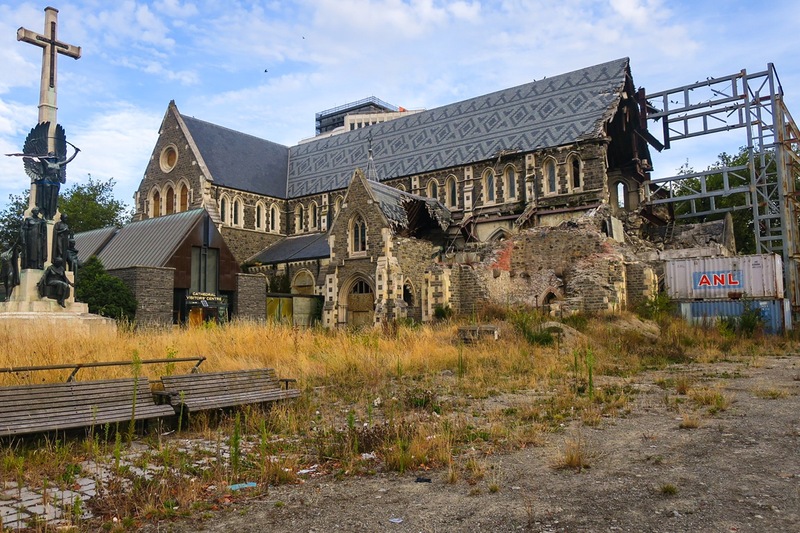 Christchurch was almost completely demolished by earthquakes in 2011 and 2012 and the rebuilding is still going on today. Almost every street is under construction and torn down buildings are on every corner. It’s inspiring to see the non-stop work that is going on here. They are clearly not taking no for an answer and are moving forward each day to rebuild the city. After the earthquakes hit and put the city in ruins, they had to figure out a way to bring life back into the central business district but knew it would be long before buildings were rebuilt businesses could run normally again. 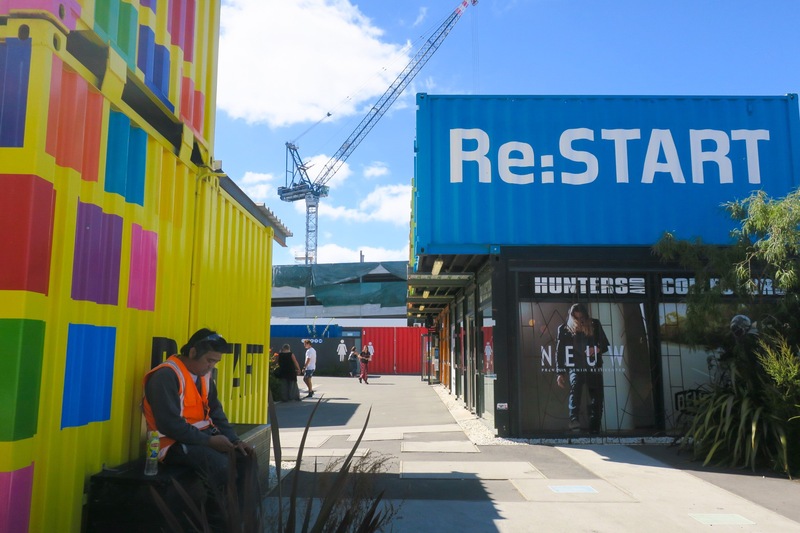 They came up with the idea of using shipping containers to house businesses during the rebuilding process as they would be strong enough to withstand any future earthquakes and would be a good solution to bring life back to the city. 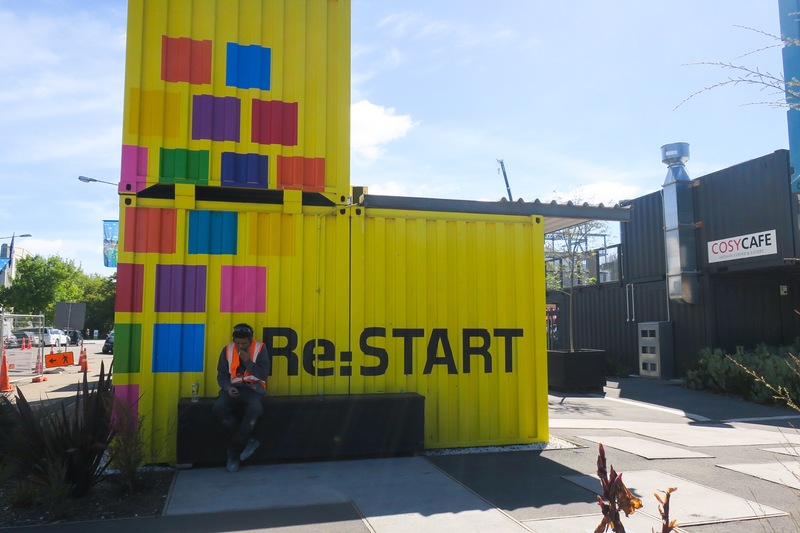 Not after long, the Re:Start mall was built. 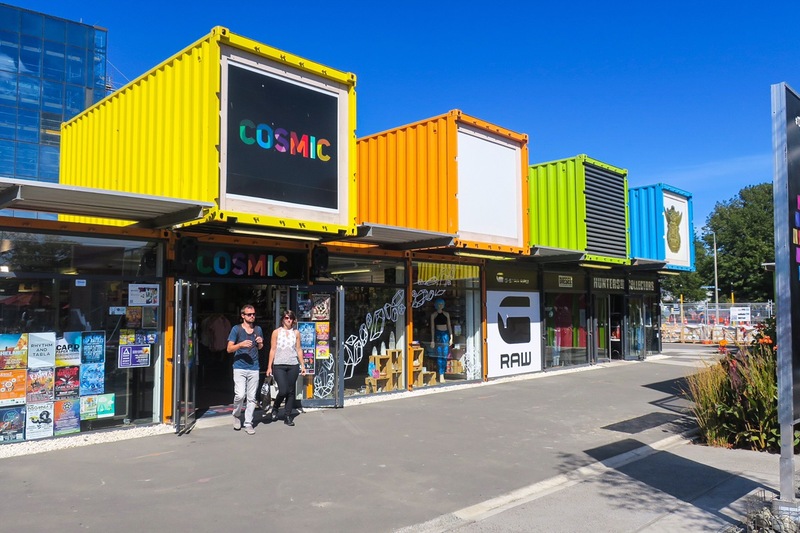 A “pop up mall” in the form of shipping containers that stack on top of each other to house small retail shops and eateries. At first it only had a few shops but has now grown to more than 50! All painted different colors, graffiti art tagged and embracing their own brand. It was so inspiring to walk around and be part of something that started so small and has now become such a staple of the city. 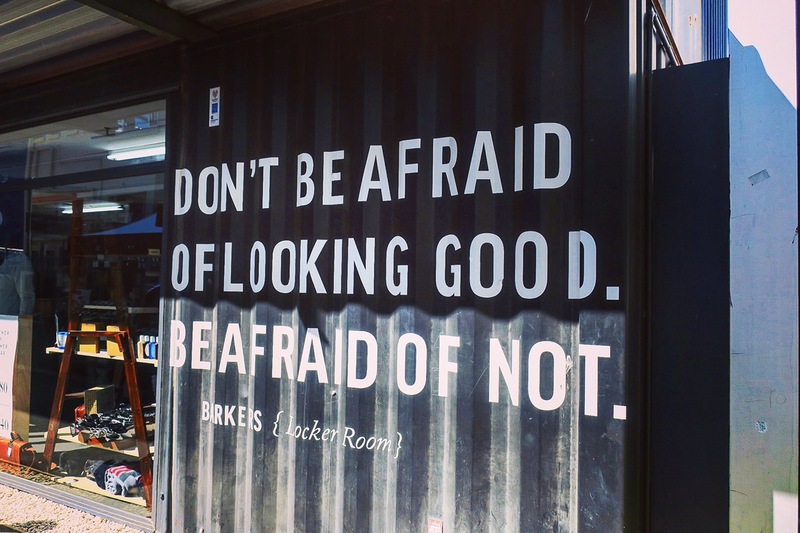 To walk in and out of shops that exemplify not giving up when life literally tears you down and rebuilding from the ground up was so uplifting. Our first night we searched for a while trying to find somewhere to eat that wasn’t insanely expensive (to our standards) or fast food. Luckily, we stumbled upon a Japanese place (shocker!) called Hachi Hachi. 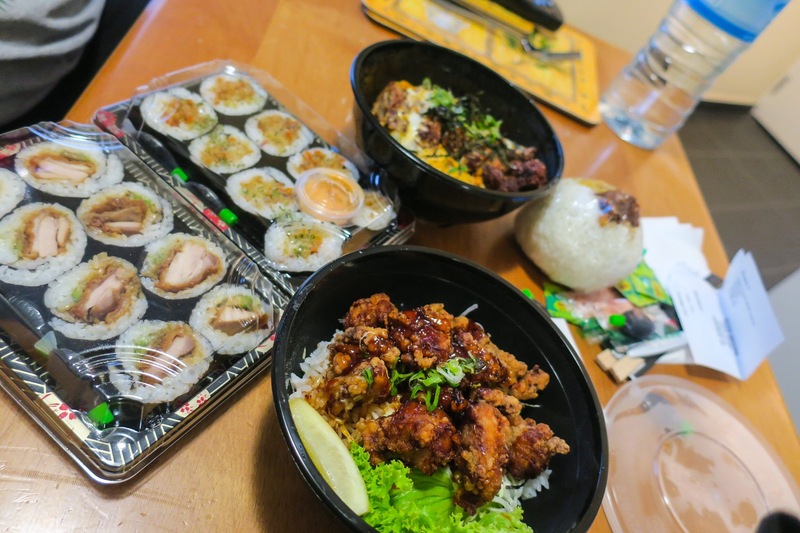 We both got Donburi, which is a rice bowl dish that can have different types of meat, fish and sauces on top. 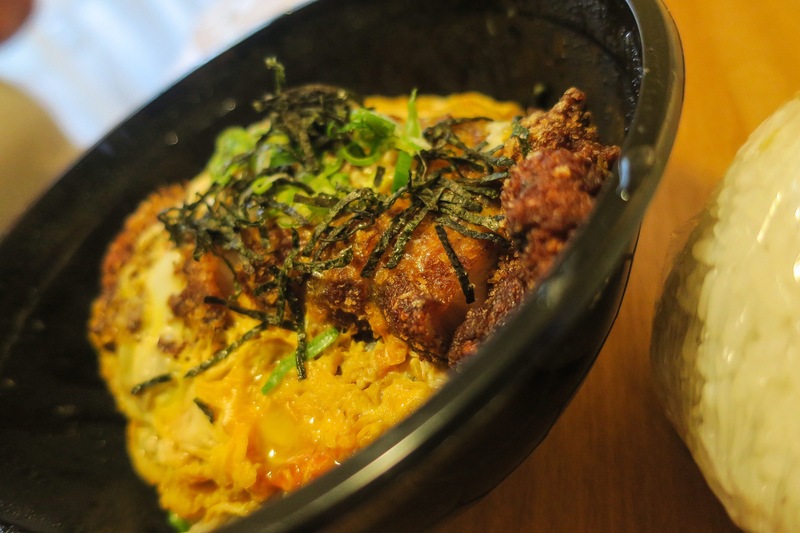 Dean got the Pork Kastu Don which is a crispy pork cutlet with a scrambled egg on top. 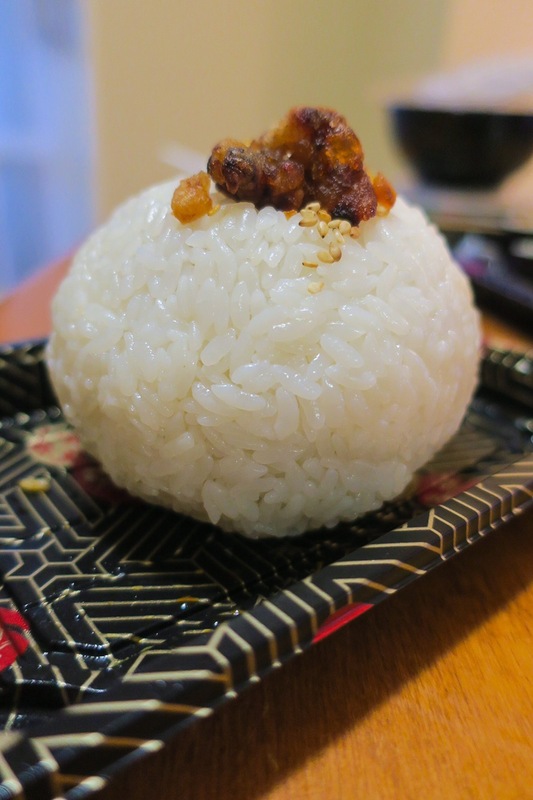 They covered it all in a sweet Teriyaki style sauce and plopped all of that on a big bowl of rice. I got pretty much the same thing, but with crispy chicken. On our way out we noticed that at the end of each night, they put their pre-made sushi rolls on sale for half price! Since we hadn’t really eaten all day (do granola bars and potato chips count? 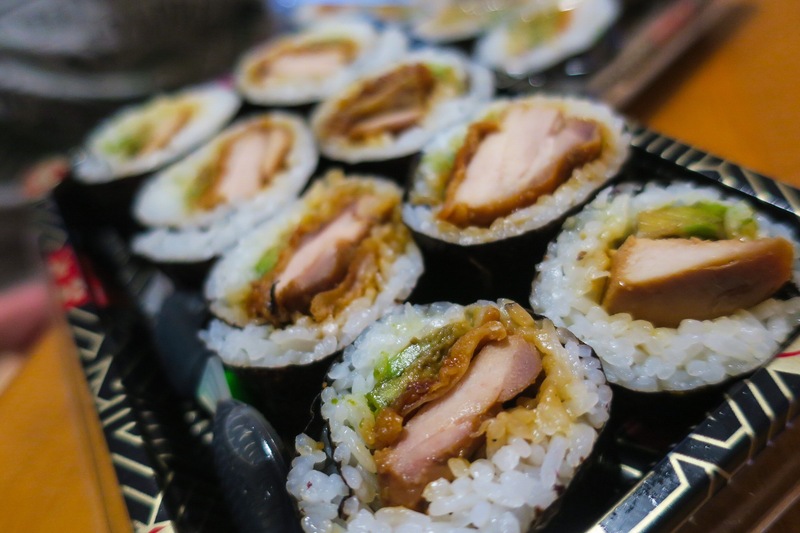 ), we decided to treat ourselves and get a few rolls to share as well. 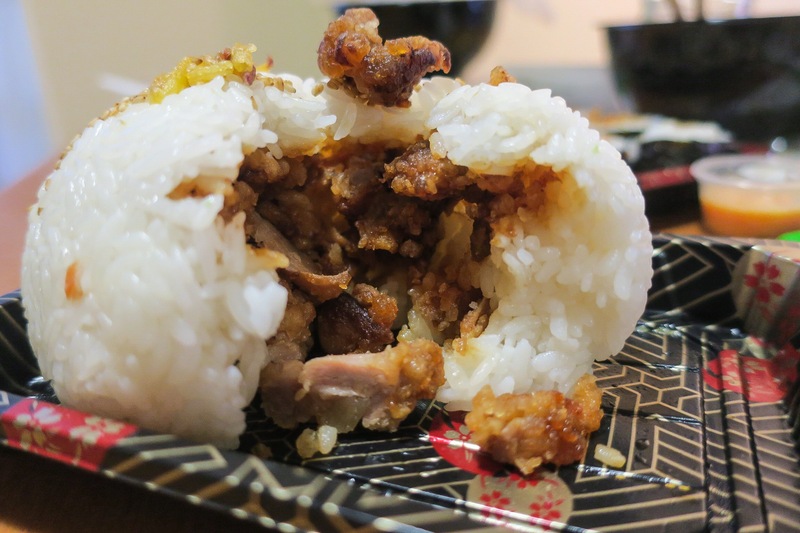 We got a crispy tempura veggie roll, a chicken teriyaki roll and they even had a huge rice ball stuffed with Karaage chicken! 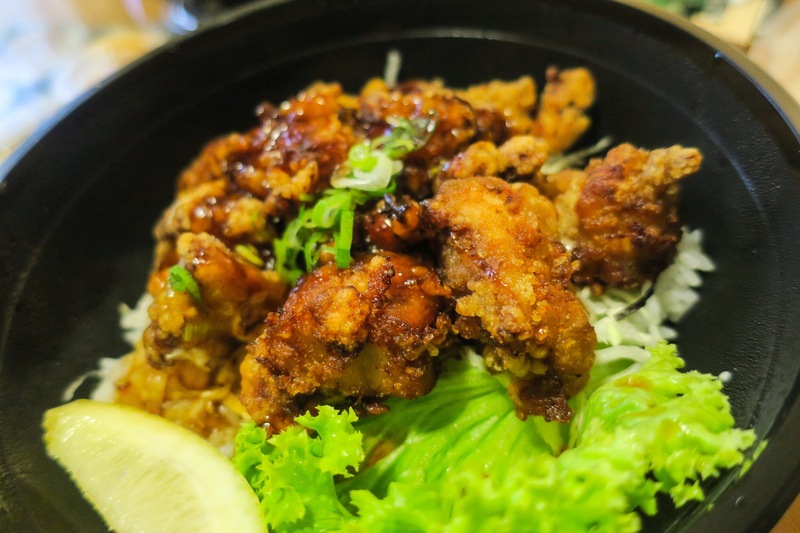 (Crispy chicken in a sweet sauce) We devoured it all and it totally hit the spot. 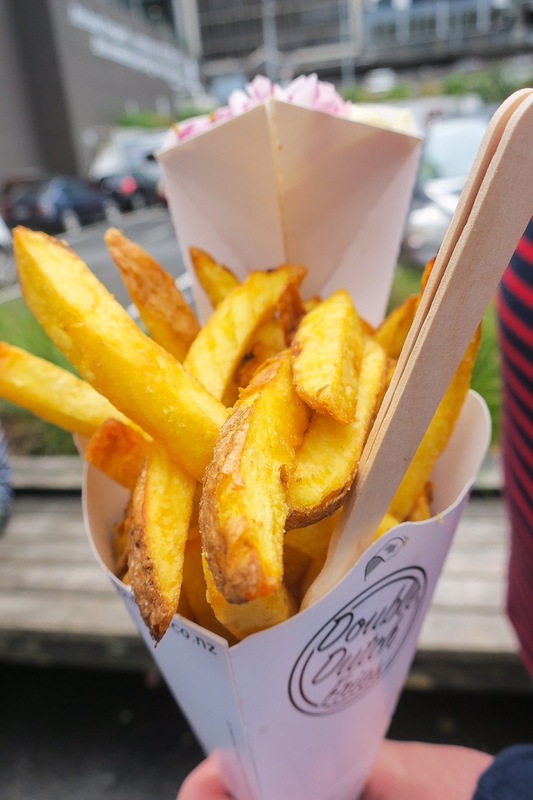 Friday’s are food truck day in Christchurch, so obviously we had to check it out! It seemed to be about half the size of any other food truck park you would see in The States.. but such a great variety of foods! Everything from Indian, Asian and Spanish to American, French and German. They had something for everyone! It was such a hard decision. The nice thing was that the trucks were priced appropriately! Everything was around $10NZ! 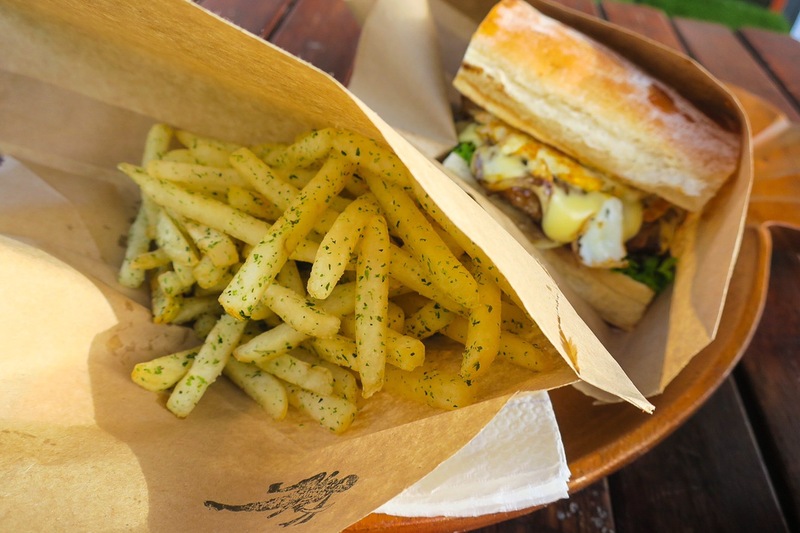 Usually at food trucks in America, their prices are comparable to a nicer restaurant. At least, that’s how it always seemed to us. We settled on this fun Japanese truck called Lucky Ninja. 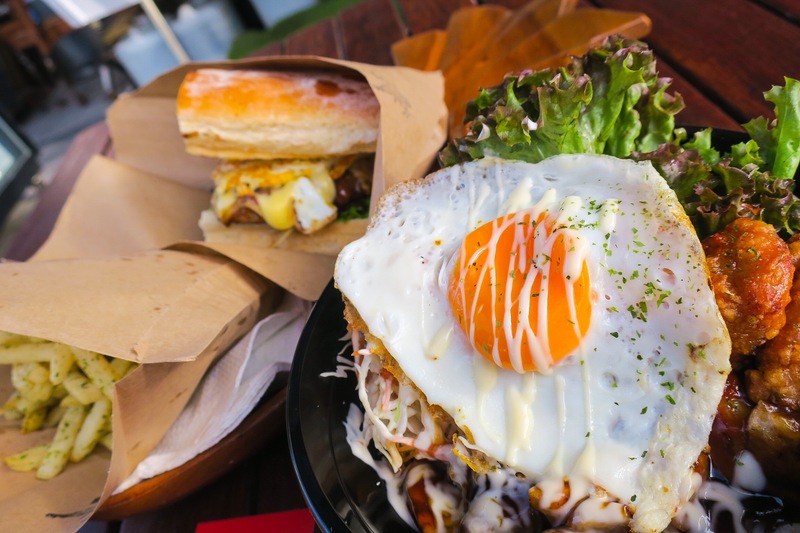 Dean got their Ninja Burger, a grass fed beef burger topped with fresh salad, crispy fried onions, creamy mashed potato, Japanese mayo, teriyaki sauce and a sunny side up egg all on a freshly baked ciabatta bun. 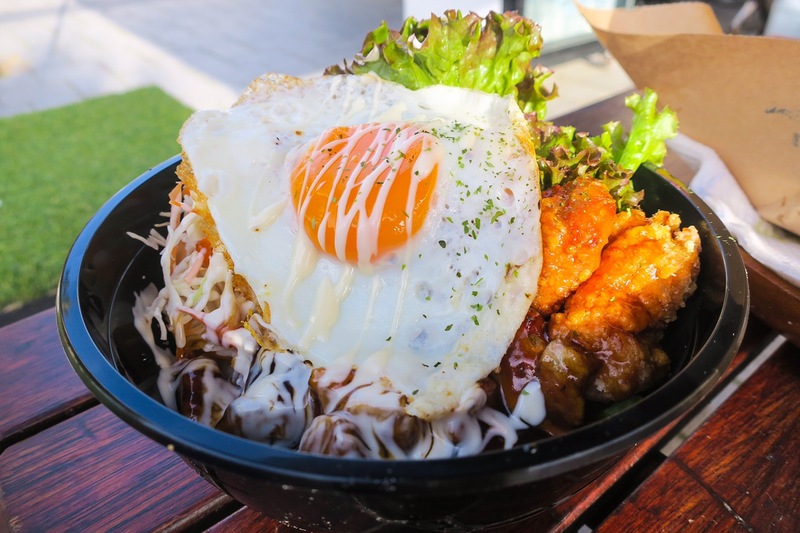 I got the Teriyaki Chicken Donburi, crispy fried chicken coated in sweet and sticky Teriyaki sauce on top of a bed of rice. I added a sunny side up egg to mine and it was absolute heaven. (Check out our instagram to see my slow-mo video of the beautiful egg, I’m so proud of it!) We shared a side of green chips which were French fries with a seaweed dusting on top. It was definitely interesting, but very tasty! 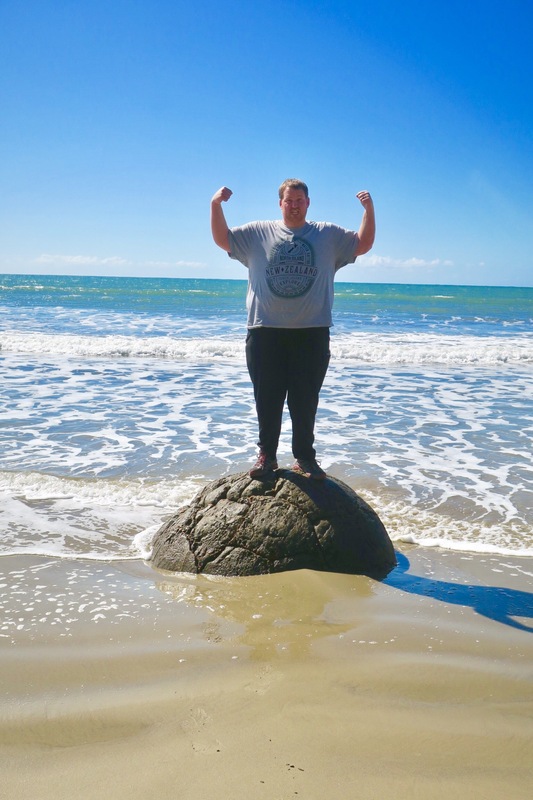 It was a great way to end or stay in Christchurch. 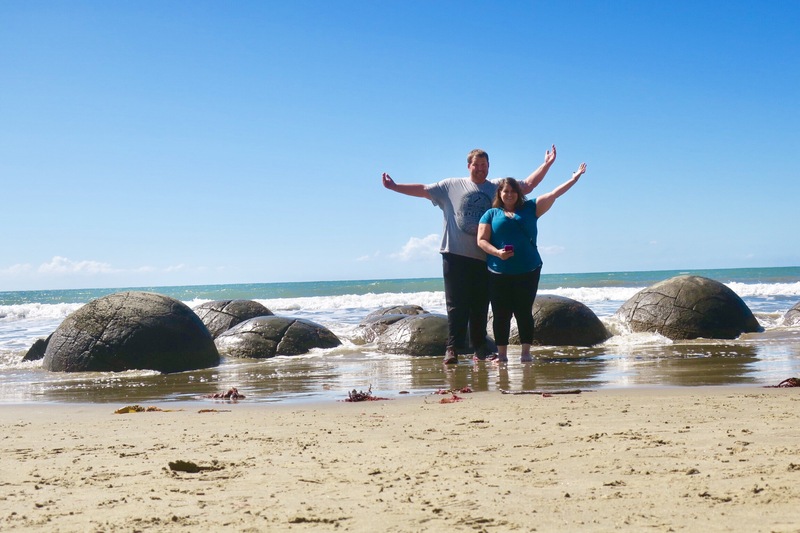 Our last stop in New Zealand was back up to Auckland. Since we only had a short time here in the beginning, we thought we’d give ourselves a few more days. Flying back on Air New Zealand was effortless, and much less hassle and time than driving back up to Picton, changing cars, taking the ferry back, etc. It wasn’t as breathtaking beautiful as the ferry, but at least we got to see it on the way down! Unfortunately, our full days here were the days the weather was gloomy, but that didn’t stop us from walking around and checking out all the shops in between periods of rain. We walked down to the harbor to see all the ships and it was so nice to sit on the dock and watch them all roll in as the clouds parted. The architecture in this area of town was classic and Victorian. The beautiful buildings next to the ocean was a gorgeous sight. It all made for such a great afternoon! 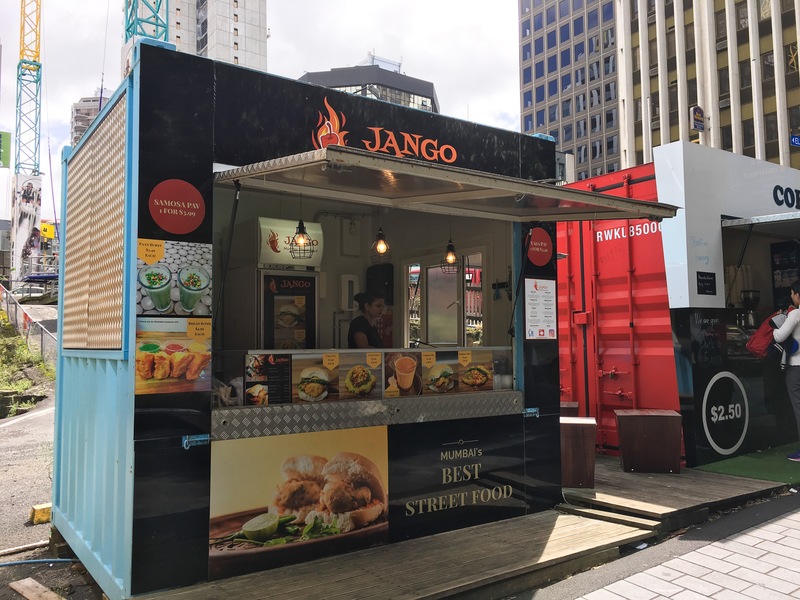 When looking for a light bite on our last day, we stumbled upon Jango. A Mumbai street foot cart on he same strip as our waffle place and french fry shop and boy did it fit the bill. 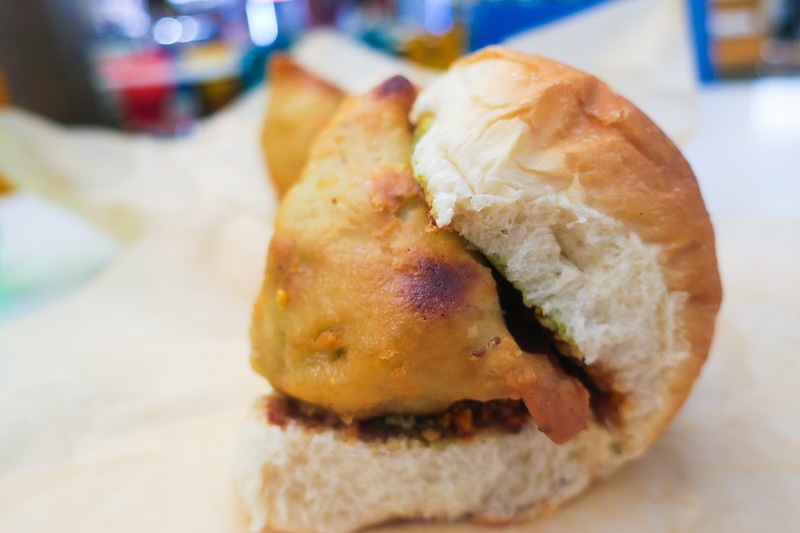 Each of us got a Samosa Pav, which is a samosa stuffed into a slider bun with tamarind and mint chutney – medium spice for me, extra spicy for Dean. It totally transported us back to the streets of Mumbai, except maybe a little more sanitary! They know their spice, too! They had quite the kick and we loved it! 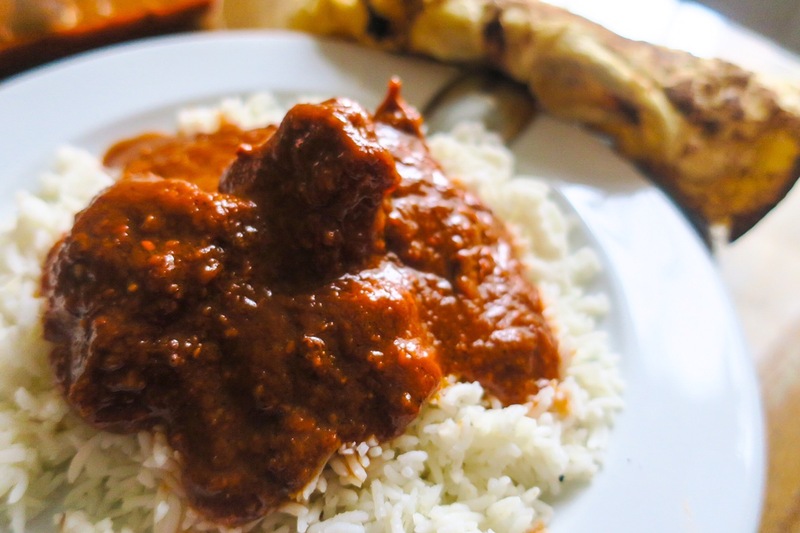 Indian spice always is a kick to your senses, and we had missed that in New Zealand! 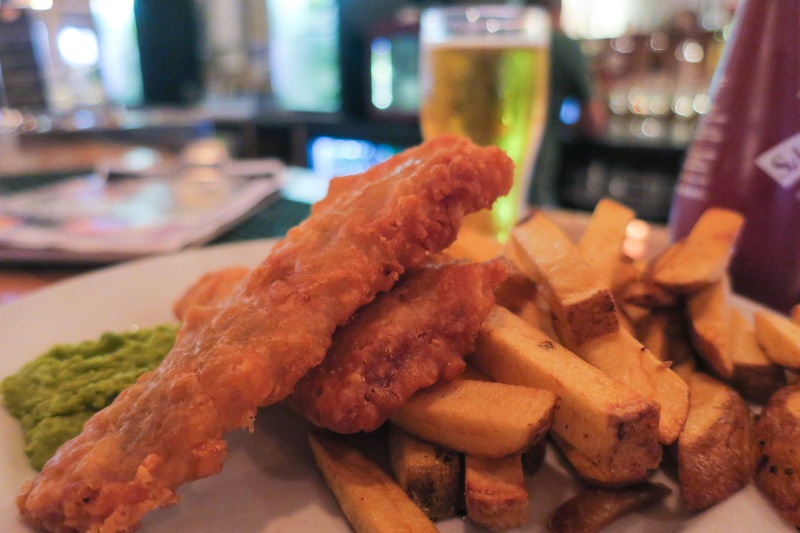 The British roots run deep in New Zealand since it used to be a british colony, so eating at a classic British pub was only fitting for our last dinner in Auckland. Being that it was Sunday, we were in search for a place that had a “Sunday Roast” and found Spitting Feathers Pub. 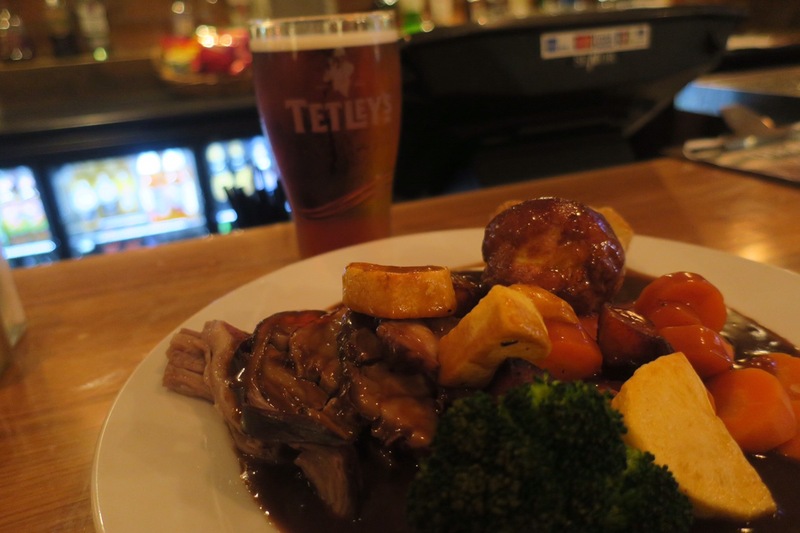 Dean got the classic dish which was both beef and pork with steamed vegetables, roasted potatoes and Yorkshire pudding all in brown gravy. He was definitely a happy guy and it was the perfect dish for a gloomy day! I opted for fish and chips with mushy peas. A simple and classic dish that never disappoints. New Zealand was breathtakingly gorgeous. We were not expecting to be so overwhelmed by the beauty of the water and scenery. It’s the kind of thing that people tell you about, but you can never truly understand until you see it with your own eyes. We wish everything was a little more affordable, however. We decided this is the kind of place you go to when it is your entire vacation. 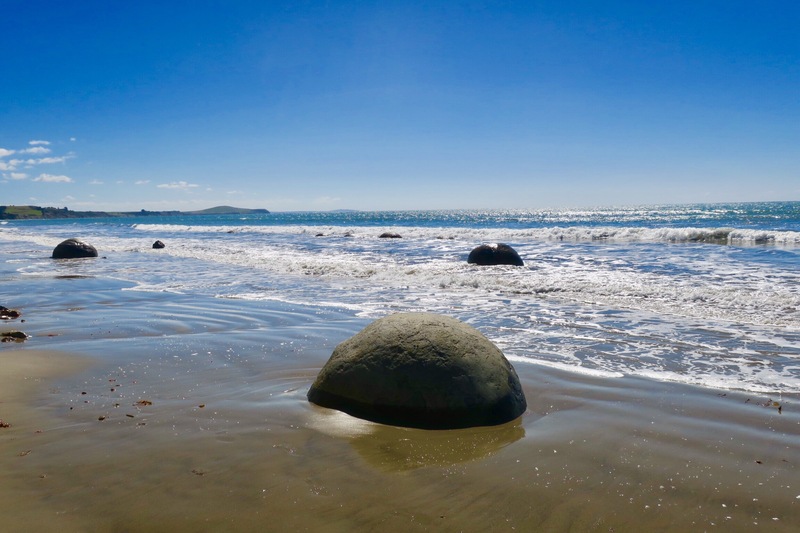 Because we have so much more we are doing and seeing, we are way more money conscious than the average vacationer to New Zealand, so because we were spending so much on the rental car, hotel and food, it limited the number of activities we could do while we were here. 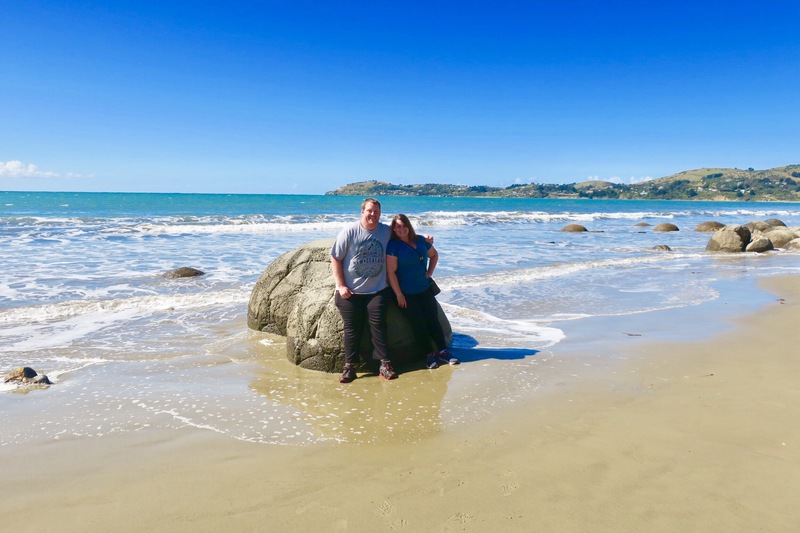 We were still able to see some amazing things for low cost or free, but weren’t able to do the fun boat tours, whale watching and swimming with dolphin type things. 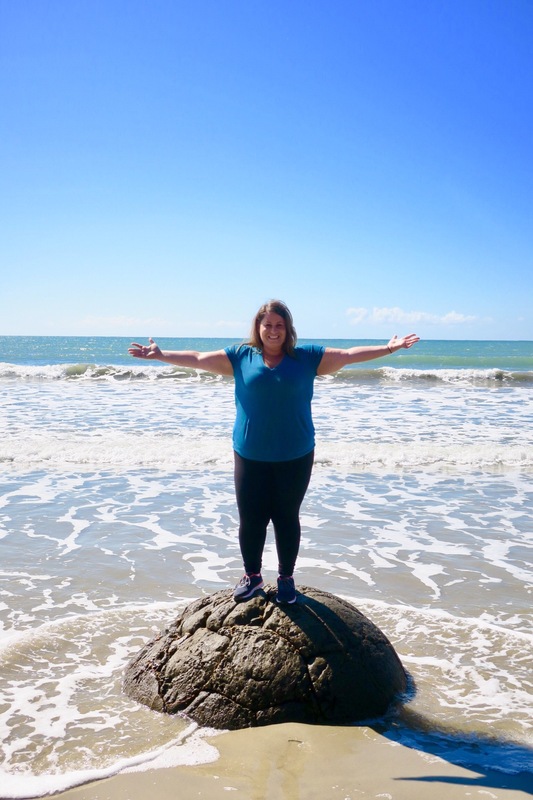 Let’s just say, not including the flight here, we spent just as much for our 2.5 weeks in New Zealand as we spent on everything including flights throughout month in South America! Next up – we’re goin down unda! Which is actually further north than we are now.. but no need to get technical. Can’t wait to start our Australian adventure in Sydney! Enjoying the blog? Want to help us go further and see more? Click here to find out how! 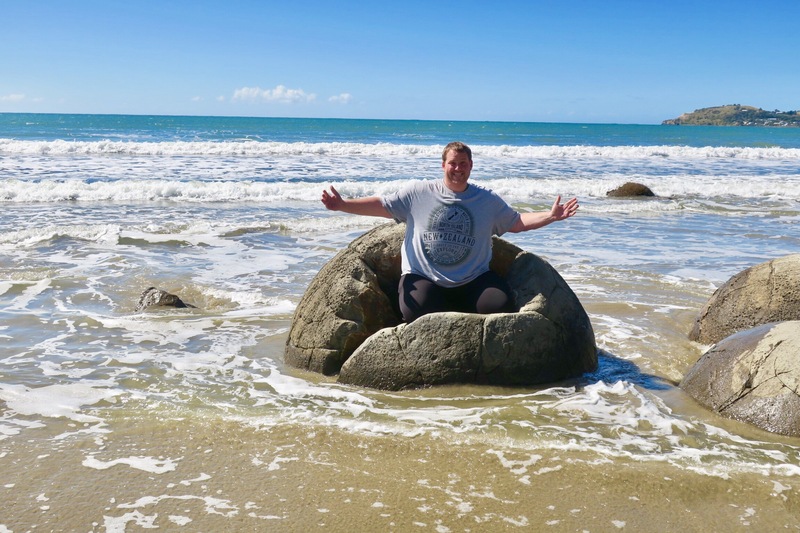 NZ is much cheaper in their winter months. Got a mistake fare LAX to Auckland for $211 RT times four, cheap rental car and cooked in motor lodges. Spent $3500 total for 10 days for 4 people. I also used hotels.com. Saving my free nights for Aug trip to Rome. Love your reports! Wish I could travel the same! So jealous!!! Enjoy and have fun. looks like a great place to visit, thanks for al the wonderful pics.